(Newser) – It was a day that Amsterdam's Van Gogh Museum may have never thought would come. "The paintings have been found!" Axel Rueger, the museum's director, said at a Naples, Italy, press conference Friday, per a release. Those paintings, according to NBC News, are two of the master's works that were lifted from the museum in 2002, said to be of "priceless value" and recovered by Italian police during a mob sting, officials say. 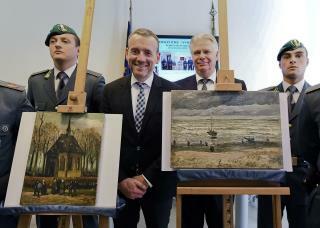 Congregation Leaving the Reformed Church in Nuenen and View of the Sea at Scheveningen, painted by the artist in the 1880s, were recovered by anti-Mafia cops poking around in a probe into the Camorra crime syndicate. "Despite a 14-year journey, the two paintings appear to be in fairly good condition," a museum press release says, noting the pieces are sans frames and look to have suffered "some damage."